It was only logical to finally dedicate a cannabis strain to Michka Seeliger-Chatelain, known worldwide simply as Michka. She is a French cannabis icon, prolific activist author, and grande dame of cannabis! This delightful, citrus-scented strain is a thrill to all sativa lovers, and is now available in a feminized version. Michka® was created by Sensi Seeds during the same breeding program responsible for finalizing the Eagle Bill® cannabis variety. During that process, a previously unseen expression of the plant caught everyone’s attention: tall, elegant, and with a distinct citrus smell. Very quickly, it became obvious that this breeding line should be preserved and perfected. And what better way to honour it than by associating it with the French cannabis expert and fascinating author, Michka? To give an even larger number of growers access to this tasty treat, Sensi Seeds has released Michka® Feminized! 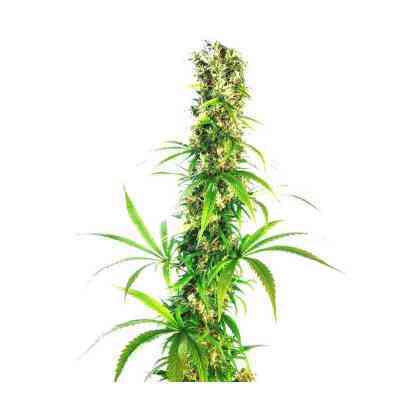 Plants produced by Michka® Feminized seeds are fast-growing. They do not show much lateral branching, which can be an advantage depending on the setup of your grow space. And by opting for this feminized version of the strain, you can be sure not to waste an inch of space, with no male plants and the bonus of no extra work needed to identify or remove them. Michka® Feminized plants grow tall, which is why the Sea of Green and Screen of Green methods are definitely worth considering if your garden lacks ceiling height and you already have experience with these methods. Just as is the case for most sativas, the flowering time for Michka® Feminized is rather long, which is a definite plus when it comes to the quality of its buds. Expect a beautiful harvest of amazing, citrusy flowers! By the time the flowering period reaches its end, your plants will be covered with lush buds so tightly packed that the stems will be almost entirely invisible! 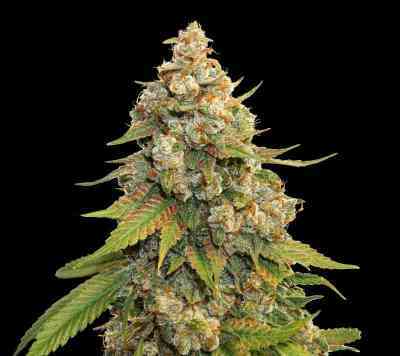 These dense, compact lime green buds are somewhat unusual for a predominantly sativa strain, as they generally produce fluffy flowers, with a structure not unlike popcorn. Michka® Feminized plants, on the other hand, develop candle-shaped colas, with little foliage and dense, tight flowers; in other words, a trimmer’s paradise, courtesy of its Silver Pearl ancestry. While the thickness of the buds may need to be monitored in order to avoid mould, the typical sativa spiral growth pattern should allow for the plant to be sufficiently well ventilated. Its satisfying harvest and unique flavour and aroma make this strain a true delight! Growers who do not benefit from lenient weather conditions are most definitely better off growing Michka® Feminized indoors, where it will thrive effortlessly. But for those located in areas that can accommodate its long flowering period, the strain is a true gift for the outdoor gardener. 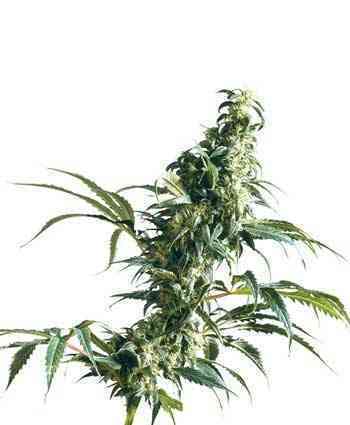 This powerful sativa can reach impressive heights when allowed to develop in free soil. Of course, this strain can also be grown in pots, if you are not ready yet to add a new tree in your garden’s landscape. Those who are fond of the typical sativa high and its energetic, mind-expanding qualities will be delighted to sample this strain, which is a perfectly potent example of them. Michka® Feminized is especially fitting to artistic activities, with its benefits of uplifting and enjoyable bouts of creativity! Michka® Feminized has a remarkably long-lasting effect, with no downside of tiredness; this is not a strain to consume if you want to sleep! Once harvested (and even a couple of weeks before), simply breaking a bud open will release its complex aroma. Several nuances of citrus can be recognized, including grapefruit and lemon! Upon consumption, Michka® Feminized is, unsurprisingly, lemony, but if the curing process has been successful, it can also provide a much sweeter taste that can remind the consumer of candy. This makes for a pleasant smoking, or vaping, experience, no matter how many times it is enjoyed. There was absolutely no hesitation as to whether naming a strain after the talented Michka was overdue. The French grande dame of cannabis, known for her free spirit and adventurous life, co-founder of the publishing house Mama Editions, is also a prolific cannabis author. Her works on cannabis growing, medicinal cannabis, cannabis history and cannabis culture are all best-sellers and revered, as she is, within the community. Sensi Seeds is honoured to count Michka among its long-time friends, and the entire team is overjoyed to finally release a strain in her honour, for the entire community of sativa lovers to enjoy! Top Sativa. Long flowering time but awesome taste!